Boathouse at Forest Park alongside Chef Jack West MacMurray III will host a signature Four-Course Schlafly Beer Dinner. MacMurray has developed over 750 beer pairing dinner menus. 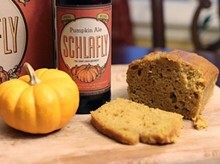 Tapping into his background and experience, Chef MacMurray has curated a four-course meal to highlight and enhance the flavors of locally brewed and seasonal Schlafly beers.